Enjoy a right royal stay in Bristol at this mighty Georgian Marriott. Excellent views of the Cathedral and some super spa facilities. Magnificent Gothic Georgian building in the centre close to the famous waterfront. Swanky ballroom for large gatherings and conferences. Terrace dining with a fantastic range of wines. Snazzy Marriott cocktail lounge plus onsite beauty and tea rooms. 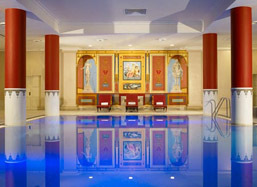 Totally lush spa facilities featuring heated indoor swimming pool, sauna, steam room and a gym. Personal trainers can be provided. Ejoys a fabulous location next to Cathedral the historic waterfront and Cabot Circus.